Highest and Best Use in Commercial Real Estate — Commercial Real Estate Loans, Inc.
What is the Principle of Highest and Best Use? In commercial real estate appraisal and valuation, the highest and best use of a property is the use a property that will bring the highest value to stakeholders. When an appraiser attempts to determine the highest and best use of a property, they must not only examine its current use, but must also look into potential alternative uses. In regards to commercial real estate investing, the highest and best use typically means the use with the highest risk-adjusted returns. However, when determining highest and best use, appraisers may also consider other factors, such as community development goals, as well as specific benefits to potential owners, especially in the case of owner-occupied real estate. When looking at the highest and best use (HBU) of a property, the potential use must meet four tests in order to qualify as an appropriate HBU. Specifically, the use needs to be physically possible, legally permissible, financially feasible, and maximally productive. The size, shape, and condition of a property must reasonably allow its highest and best use. For example, an office building with a 20,000 sq. ft. footprint would not fit on a 10,000 sq. ft. site. And, a building planned with a large basement or below-ground area could not reasonable be constructed in area with a high water table (i.e. South Florida). In general, this test refers to zoning and building regulations, which typically limit the size, footprint, and use of a property. Appraisers likely already have a deep knowledge of the zoning rules in the area in which they practice, but regardless, this information is easily accessible. This test may also include environmental laws and regulations, which work to ensure that a building does not have a particularly negative impact on the surrounding environment. For larger projects with a high degree of profit potential, developers may wish to pursue a zoning exception, also referred to as a variance, with the appropriate city or municipal body. To be successful, however, they must typically demonstrate that the project will lead to significant economic development or other benefits to the surrounding community. To determine how financially feasible a proposed property use is, an appraiser would attempt to examine it as it if it were already in existence, by creating pro forma financial statements. To do this, they would need to conduct a full market analysis, estimate development and construction expenses, OpEx, potential cap rates, vacancy rates, and a variety of other factors. With all this information, an appraiser can create an estimated IRR (internal rate of return), in order for potential developer or investor to determine whether it’s sufficient for their return requirements. By using discounted cash flow analysis, an appraiser can also calculate the net present value of a property with a specific required return in mind. If it’s above zero, than the property exceeding the required return. While it may not necessarily be calculated by the appraiser, developers can also do some quick math to determine a project’s potential equity multiple over a specific time horizon. Both of these metrics can be calculated in an unlevered (without debt) and levered (with debt) fashion. In certain cases, developers may also look the estimated residual land value of a property after potential improvements. After examining the potential uses for a property that are both legal, physically possible, and financially feasible, an appraiser will rank them based on risk adjusted returns. In many cases, the options with the highest potential for returns will ultimately be too risky for investors, so appraisers often apply a discount rate based on risk to adjust a property’s IRR. Highest and Best Use: The property is currently maximizing value for owners/investors, and perhaps the surrounding community as well. Nothing substantial can be done to improve its value. Under improvement: The property may not be currently at its highest and best use, but it provides a reasonable return to investors and a property demolition would not likely provide a worthwhile ROI. However, a renovation or expansion might, depending on the circumstances. Overuse: The property currently violates zoning or building regulations, for example, a building could be too tall in a zone that only allows buildings up to a certain height, structures may go too close to property lines, or it could be a commercial property in a purely residentially-zoned area. If the building is an overuse based on new zoning regulations that were put in place after it was built, it may be ‘grandfathered in.’ Otherwise, the owner may have to pay a fee or adjust the building to conform to municipal standards. Non- Highest and Best Use: The property is clearly not being put to its highest and best use. For example, a property with large, 2-story apartment building in a high-demand area that permits 20-story condos. The current land improvements should be demolished to make way for new development. The principal of highest and best use can be used for either vacant land or land with existing improvements. 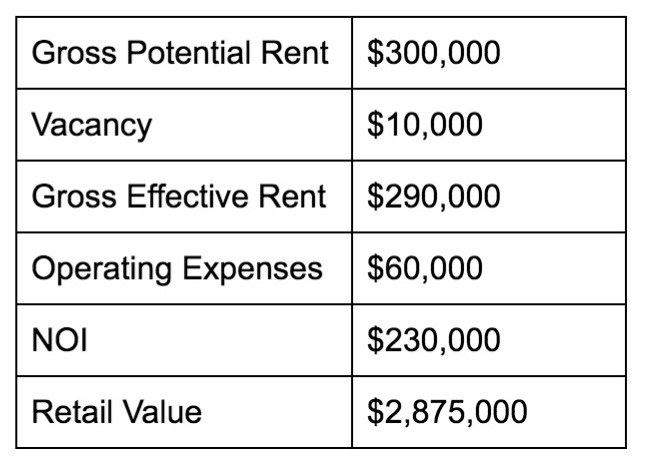 For example, if we were to examine a vacant lot and determine which type of property would generate the most profit at sale, we could analyze the profit margins for various classes of commercial real estate (as found in the table below). However, this does not take into account legal permissibility, market demand or risk ( for example, hospitality properties are generally far riskier than multifamily apartments). All other things being equal, however, if the example below were true, hospitality would be the highest and best use of the property, followed by residential, commercial, and retail. To demonstrate how highest and best use can be used for a property with an existing structure, let’s say that an older building in a mid-sized metropolitan area is currently being used as an apartment building. While rents have not greatly increased, the city has seen a massive influx of tourism in recent years, and there’s a substantial demand for hospitality properties. The building is $15,000 sq. ft. with a vacant land value of $15/sq. ft., bringing the vacant land value to $225,000. As apartments, the building generates $20/sq. ft. of rent, with a vacancy rate of 3%, and operating costs are $60,000/year. If area cap rates are about 8%, we would estimate the building’s current value at $2,875,000. In this example, let’s say that hotel properties rent for approximately $35/sq. ft. Since we already know that it’s an attractive market for hospitality properties in the area, an investor/developer may wish to invest into renovating the property into a hotel, which they could then rent to a hotel chain and, within a few years, sell the property for a profit. Converting the property will cost $1 million, and will take approximately 1 year, during which there will be no income from the property. Operating costs are $4/sq. ft. and increase by $0.50/sq. ft. each year. Assuming we have a regional or national hotel chain willing to sign a 10-year lease with rent that increases 3% annually, we will have zero vacancy past the first year. In the table below, will look at the property over a 6-year period to assess it’s potential profitability. If we also assume that the average area cap rate remains the same, approximately 8%, we can take Year 6 NOI to determine a potential resale price of $6,131,250. This example is done unlevered, and assuming that the investor fully owns the property and has the cash to upgrade it themselves, and wants to do so, which is unlikely. If we were to add debt in, for instance, a construction loan in Year 1 and a refinance in Year 2, it would significantly decrease the upfront capital improvement costs, but would significantly decrease NOI. However, it would still likely increase IRR significantly.